The International Diabetes Federation (IDF) is an organization of over 230 national diabetes associations worldwide. It represents the interests of the growing number of people with diabetes and those at risk and is engaged in action to tackle diabetes from the local to the global level. 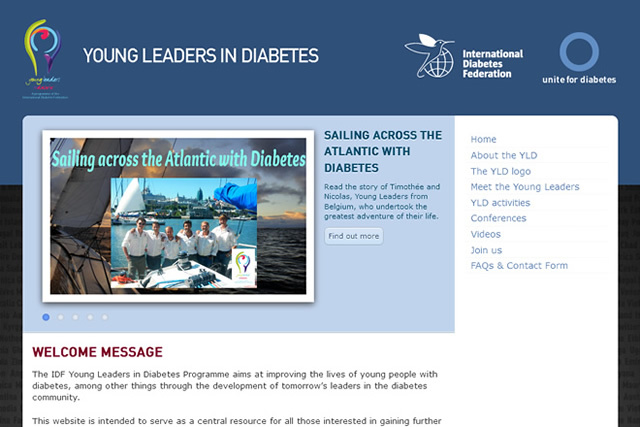 Their Young Leaders in Diabetes Programme (YLD) unites young people with diabetes from around the world to raise awareness and support several projects to enhance the lives of young people living with diabetes. The IDF approached me to create a stand-alone website and platform for the brand new YLD. It included a public website with member profiles, upcoming activities and upcoming conferences and a private member discussion forum. To higher recognisability, the site’s layout had to be the same as the general IDF-website. Note: The website has since undergone some changes and was recently completely integrated into the main IDF-website.